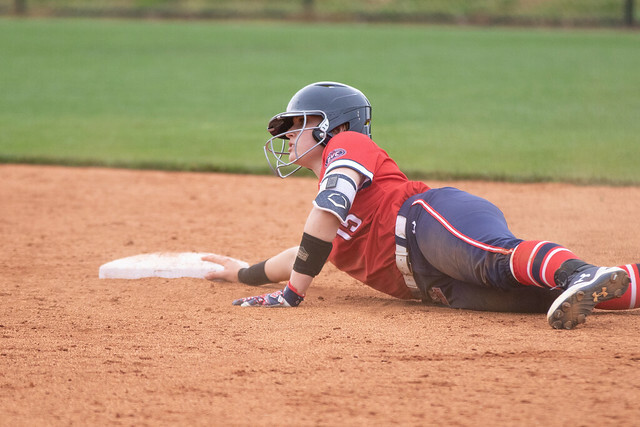 The Belmont softball team split a doubleheader against Jacksonville State at E. S. Rose Park Friday, winning the first game 8-0 and then falling short in the second game 7-5. This was the Bruin’s first win against Jacksonville State since 2015 when they pulled out a victory with a score of 4-3. Belmont went down to eighth place in the OVC standings while the Gamecocks are tied for second with Southeast Missouri. In the first game, Belmont sophomore Alicia Veltri brought the win home, lasting all five innings and only allowing three hits. She struck out seven batters and walked zero. The Bruins started their rally in the second inning when freshman Audrey Lyle singled to right center, bringing junior Bayley Cook and sophomore Cheyenne Cavanaugh home and making the score 3-0. The rally continued in every inning with sophomore Ellison Ollinger bringing in two runs with a single in the third and Cook scoring on a passed ball in the fourth. Cook went 2-3, silencing the Gamecocks in the fifth inning with a line drive triple to right center. This allowed Cavanaugh and Ollinger to round the bases and make the score 8-0, ending the game with a mercy rule. The Belmont players raided the field and celebrated their long awaited win against Jacksonville State. In the second game, junior Brooklin Lee took the loss, allowing three hits and five runs. Veltri and junior Brittney Kennett allowed one run each. The Bruins were scoreless in the first three innings and gathered three errors. Gamecocks senior Taylor Beshears hit a grand slam in the second off Veltri, bringing the score to 6-0. Belmont answered in the fourth when Veltri knocked a triple into center field and scored off an error. Senior Hayley Baker shot a double to center field bringing around Ollinger and senior Chelsea Thomas. With the score 6-5 at the top of the fifth, the Bruins started to look hopeful, but the Gamecocks squeezed in one more run off a sacrifice fly from senior Amber Jones. The game ended with no more runs scoring, bringing the Bruins a loss of 7-5. The Bruins will stay in Nashville to take on Tennessee Tech in another doubleheader and to celebrate Senior Day on Sunday at 1 p.m. and 3 p.m.. This article written by Laura Privott. Photos by Colby Crosby.